Fresh Economic Thinking: A sign of desperate times? 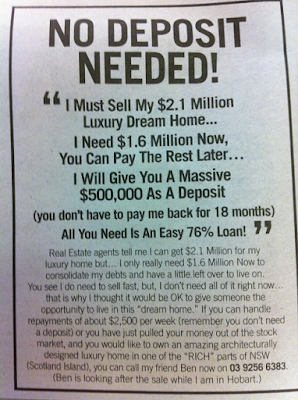 Saw this advertisement today in the Financial Review. I haven't seen anything like it before but it reeks of desperation. Is it some kind of joke? 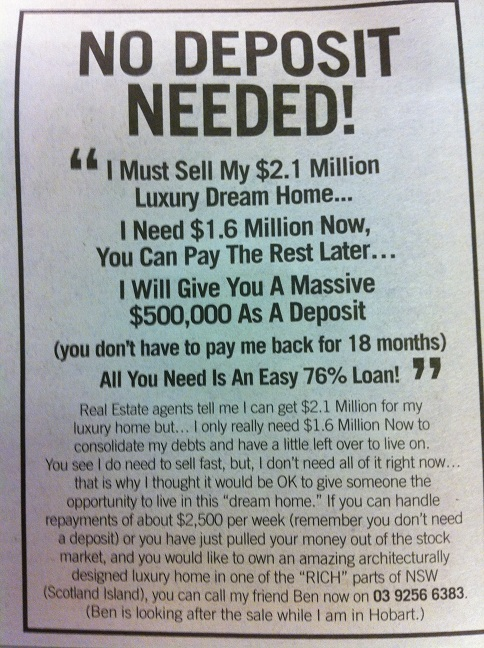 I like the first part of the fine print "Real Estate agents tell me I can get $2.1million for my luxury home but..."
First of all thanks for the comment and encouragement I appreciate it. The Liberal Democratic party have some good idea's, they could dramatically transform the country and the governments bottom line for the better if their figures are correct. Although as always the government will be reluctant to make big changes to the taxation system and changes to the welfare system that could be construed as class warfare. Personally I have experienced both sides of the coin, I know what its like to be staring down the barrel of higher tax brackets, but I also know what its like to be unemployed. I'm not sure if you’re aware of the current Centrelink policies, but they very much encourage low income earners to remain on unemployment benefits. After a person earns more than $62 per fortnight they have their payments reduced by between 50-60 cents in the dollar for every $1 they earn. In most cases this leaves the person on benefits often making $2-$3 an hour net (after transportation etc), making working a pointless chore for very little money. The Liberal Democratic Party’s policies could definitely motivate people back into the workforce instead of continuing the cycle of welfare dependence. I would love for the treasury to do some costing's on how this policy alone would affect the budget. As far as the housing market goes all of us at Macro business know the jig is up and the real question is how low will it go and how fast. I would have said dodgy rather than desperate. Chances are 'Ben' does wrap loans or something similar.